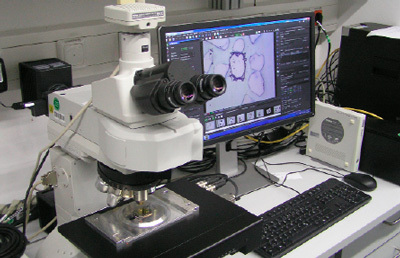 Figure 1 - Nikon Eclipse motorized microscope at the Potsdam SIMS facility. The aluminum jig on the sample stage (here containing a SIMS sample holder with a zircon mount in it) was made in-house and is used for positioning the sample holders. With a positioning reproducibility of ~50 µm, it is designed for advanced selection of target points, avoiding SIMS analytical time lost on target selection. Understanding the fine-scale surface structure of a material can be key for many applications in the Earth sciences. For example, characterizing grain abrasion in a clastic sediment or describing the morphology of surfaces produced during a hydrothermal reaction experiment. A common approach to such imaging tasks is the acquisition of secondary electron or backscattered electron images using a scanning electron microscope (SEM). Such images provide excellent lateral resolution. 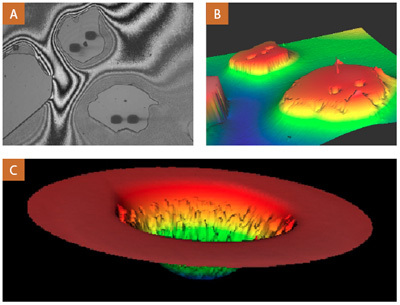 Furthermore, by applying a variety of strategies—such as segmented electron detectors and software-based reconstructions using sample tilt, or using stereographic image pairs—it is possible to use 2-D SEM images to construct accurate 3-D models of a material’s surface and so obtain surface structure information at the nanometer scale. In situations requiring even finer-scale information, it is possible to turn to the atomic force microscope (AFM), which also has the advantage of providing information about the mechanical properties at the nanometer scale. But what solutions are available when SEM and AFM are not suitable (e.g. the sample is not vacuum compatible, or when it consists of unconsolidated grains), or when large regions with millimeter or centimeter dimensions need to be investigated? Being responsible for a secondary ion mass spectrometer (SIMS) facility in Potsdam (Germany), I often need to assess what is happening in the Z (height) dimension of a sample. One common need is to determine whether the polish on a sample mount is of acceptable quality in order to obtain a meaningful isotopic measurement. Our SIMS instrument is capable of producing isotope ratio data with an analytical repeatability of better than 99.99%, but such data are reliant upon a high-quality surface finish: even 10 µm of sample relief can affect the data. Such relief can easily result when a hard silicate has been polished in a relatively soft epoxy mount. In such situations, surface roughness and step-heights need to be monitored at the µm-scale on sample surfaces that can reach centimeter dimensions. A second need is to determine the morphology of the craters formed during the SIMS ion sputtering process. This information is required not only for calculating the volume of sample that has been consumed during a single measurement process but also to reveal when an analysis may be unreliable due to an usual crater morphology, as might arise when sputtering a µm-size inclusion or there being a small scratch at the analysis location. To address these problems and situations, we have two tools in our laboratory: an optical microscope with a fully motorized sample stage, and a white light interferometer. Figure 2 - (A) Reflected light image of a feature on a RAM memory card made without the extended depth of-focus function. This was acquired using the 2.5× objective, yielding a field-of-view of around 5.6 mm. (B) The same feature as in (A) but here imaged using extended-depth-of-focus software. This image was computed from 106 individual images acquired with a 10 µm stepping distance in the Z direction. Producing this image took ~9 minutes. (C) A 3-D topographic model of the RAM memory card shown in (A) and (B). This visualization provides valuable topographic information, but in featureless areas, such as the holes through the middle of the copper connector pads, the software is unable to correctly contour the surface. Our sample preparation room contains what looks like a standard optical microscope that is capable of providing both transmitted and reflected light observations (Fig. 1); the system includes 1×, 2.5×, 10×, 20×, and 50× objectives. The only obvious difference between our Nikon Eclipse and a “typical” petrographic microscope is that the sample stage is not round and it cannot be rotated. Less obvious is that the X, Y, and Z axes of the microscope are fully motorized. This is the fundamental strength of our Nikon system. By scanning the stage in both X and Y directions and using the lowest magnification objective in reflected-light mode, it is possible to record the entire surface of a 25 mm diameter circular mount in only 12 images. Nikon image-stitching software can then generate a high-quality mosaic, corrected for variations in illumination intensity and stage shift, where a single pixel is equivalent to ~4 µm. This acquisition and stitching process takes only a few minutes; importantly, such images can then be directly loaded into the SIMS pointlogging software. The Nikon Eclipse’s motorized sample stage, with its submicron precision stepping drive, allows one to map in all three dimensions. By acquiring a stack of images and by applying the system’s optional extended depth-of-focus software tool, resolution-limited images can be obtained despite possible large topographic features (Fig. 2), the software identifying which image provides the best sharpness for each of the 5 million pixels acquired by the CCD camera. The Z resolution of the resulting model is dependent on the depth of focus of the individual objective. Hence, it would make little sense to use the 1× objective (which has the broadest depth of focus) in conjunction with a one micron Z-direction stepping distance. On the other hand, by using the 50× objective, which has the sharpest depth of focus, it is possible to identify micron-scale step heights on samples that have sharp features for the software to render. With our system, it is possible to combine the X–Y mosaics with the Z-direction scanning to get precise depth information over large areas. However, there are practical limitations in terms of how long such data acquisition takes and the ability of the controlling computer to handle the resulting gigabytes of data. One limitation of the 3-D modeling system is that both the 1× and 50× objectives have quite short working distances, meaning that samples with topographic features much in excess of 2 mm cannot be addressed … the sample would simply collide with the objective! For topographic information at the submicron level, we turn to our NewView 7100 white light profilometer (Fig. 3A). This tool works on the principle of optical interferometry, whereby interference patterns are formed between light reflected from a sample’s surface and light reflected from a very flat reference mirror. The optical axis of the instrument must be perpendicular to the sample’s surface at all times. To achieve this, our system includes a sample stage that is motorized not only in the X and Y directions but also in pitch and roll. Automated routines are available for optimizing sample tilt, focus, and light brightness. 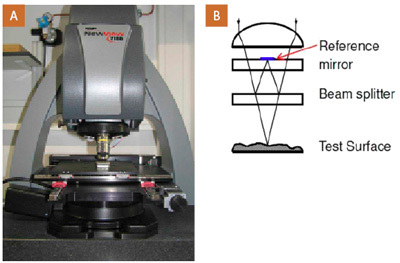 An actual measurement involves raising the microscope head in a very precise manner because increasing the distance between the sample and the objective changes the interference pattern, which in turn is recorded by a CCD camera with an acquisition rate of 72 Hz. The distance of travel in the Z direction depends on the topography of the material being analyzed: for many of our applications we use a travel of only 20 µm, which requires around 20 seconds for data acquisition and display. The fields-of-view widths of the NewView 7100 system’s Mirau objectives are 1,000 µm for the 10× objective and 200 µm for 50× objective (Fig. 3B). 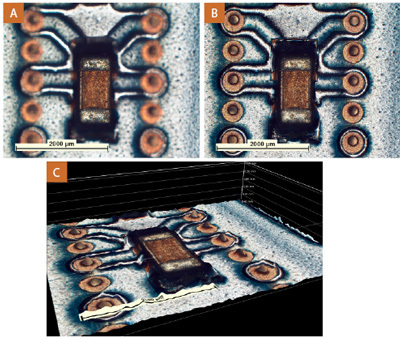 Instrument-specific hardware and software applied to the many CCD images recorded during a single measurement scan allow researchers to reconstruct the light intensity versus Z-position for each pixel within the field-of-view. From these patterns, it is possible to mathematically fit the Z-position of the sample surface for each pixel with an uncertainty of better than 1 nm. An example of an interference pattern is shown in Figure 4A, and the resulting topographic model calculated from a large stack of such images is shown in Figure 4B. Our NewView software offers a wide variety of functions, including length, step-height, distance, and sample roughness determinations. One further function of particular value when characterizing SIMS sputter craters is volume determination relative to a user-defined reference plane: based on our experience this function is reliable to around ±10% for small SIMS craters. A software function making use of the X–Y motorized sample stage allows image stitching when large areas need to be evaluated. However, it is impractical to make scan images much larger than 5 mm, even with the 10× objective. The only real shortcoming that I have experienced with the system is the difficulty of recovering sufficient data from steeply inclined surfaces, such as the walls of SIMS craters. For these somewhat extreme examples, it is necessary to interpolate the Z-portion between nearby pixels. Figure 4 - (A) White light interference pattern obtained from a zircon sample containing four SIMS sputter craters; data recorded using a 10× Mirau objective. (B) Topographic model calculated from a large stack of such images. The “cliff” in the lower left has a height of 2.5 µm between the zircon standing above and the surrounding epoxy. (C) Detailed image of the right crater on the front zircon grain acquired with the 50× Mirau objective. The crater is 35 µm × 25 µm and has a volume of ~496 µm3, equivalent to a sampling mass of 2.3 ng (assuming the density for zircon is 4.7 g/cm3). I hope this brief foray into realm of optical profilometry might generate new ideas for novel applications. The technologies are very powerful and offer a good alternative to reserving analytical time at your nearby, albeit friendly, SEM facility.